The idea of making creme brulee scared me. Really scared me. It was always one of those desserts that should be saved for fancy restaurants, extreme cooking & baking shows on TV like Top Chef, or even luxury food trucks. Not to be made in my less than stocked kitchen. Easter was approaching, and knowing my love of baking, Chris' parents asked me to make dessert for our Easter celebration. I happily obliged. 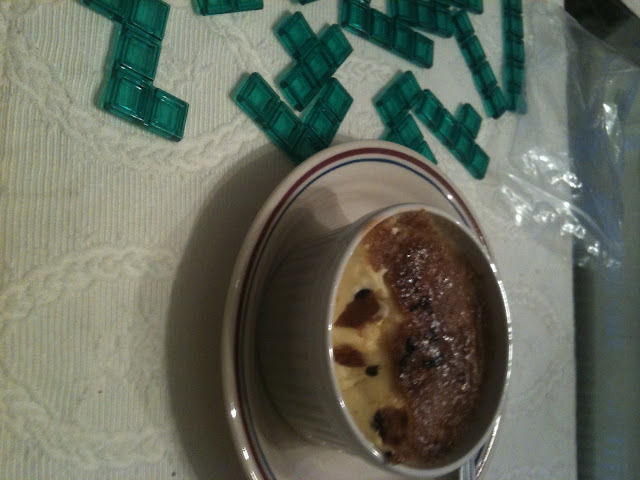 Then they asked me to make creme brulee. Not one to turn down a baking challenge, I said okay. I started stalking foodgawker, the food network, and any other sites that may give me the inside scoop on how to not ruin creme brulee, even for first timers. Who would have known that the decadent dessert only has 5 ingredients, most of which that were already in my pantry? Started feeling better. After reading all of the steps to mentally prepare myself for this impossible feat, I realized it's not that hard at all! I picked up some mini ramekins from Ross, which were not only cute, but only $3.99. Score. And the best thing about this dessert? You can make them ahead of time, refrigerate over night or hours earlier. Which means no worrying about hurrying to finish before your shindig, or planning for baking time after you are finished with your dinner. After pre-making the dessert, all you have to worry about is mixing the topping of brown sugar, sugar & a couple drops of vanilla to sprinkle on top, pop in the oven to get crisp, and serve! The finished product! Too bad I didn't remember to bring my camera to dinner, so my final shot wouldn't be horribly grainy and crap iPhone quality. Oh well. If we're being totally honest, it had some room for improvement. I'm certainly not going to win any awards for it but I had fun! And want to keep working on my technique. The best part is the bruleeing, right? We love creme brulee. good for you for trying it! I'm still in shock that it actually worked! I was under the impression that this dish involved a mini-blowtorch? ...I might have to try this as a summer project. Me too! Which is part of the reason I was so nervous to try it out. Turns out you can just pop them in the oven and it does the same thing! Good job- they look tasty!